Join in the #DayofChange Celebration! 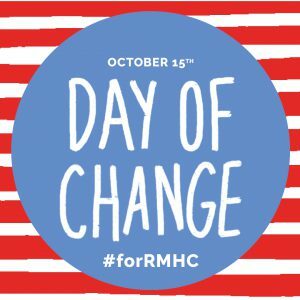 On October 15th, RMHC celebrates its annual Day of Change! This is the day when the entire RMHC global organization commemorates the opening in Philadelphia in 1974 of the very first Ronald McDonald House. To celebrate, we rally around Donation Boxes at each McDonald’s restaurant. It is because of our mission partner, McDonald’s, that our organization was created and to this day, they help us continue to support families when their child needs medical attention. 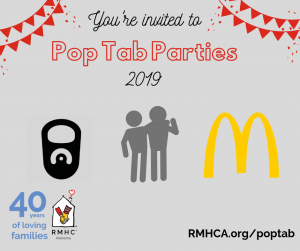 RMHCA will be at several local McDonald’s restaurants (listed below) to celebrate with you! We’ll also have more information on how to get involved with RMHCA. If you are not near one of these locations, don’t worry, stop by any McDonald’s with a Donation Box and make your change count! Your change can make a significant change for families who must travel to Birmingham for their child’s medical treatment. Together, we can make a big difference in Birmingham for #RMHCA. Because of your support, we provide stability and resources to more than 1,000 families every year, and support more than 64,000 visits to our Ronald McDonald Family Room. We would love to see you at these locations on October 15th. If you are unable to get to a McDonald’s on Day of Change, you can always donate online for RMHCA! You can also help share the event by joining us on social media — be on the lookout for some of the Houses’ supporters as we show you how they are preparing for the big day! We have set up a Facebook event page and will be keeping you updated on other ways to show your support for the organization! And don’t forget, you can donate your change every time you visit McDonald’s by simply dropping it into a Donation Box at each drive-thru window and counter location. That way, you will be helping us throughout the year. Thank you for all that you do to help our mission.